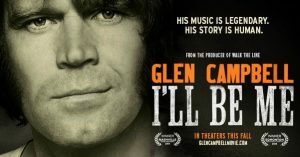 Movie Night: "Glen Campbell: I'll Be Me"
We will host a second movie and discussion night this Sunday, October 22, from 6:30-8:30pm in the Music Room. We’ll watch “I’ll Be Me,” a beautiful, funny, and inspiring film about music superstar Glen Campbell’s struggle with Alzheimer’s disease before and throughout his sold-out “Goodbye Tour.” No registration required. A Culinary Committee is Forming!